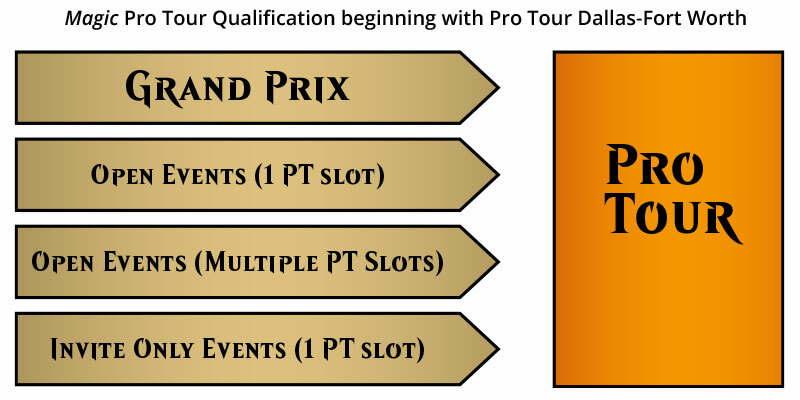 The Grand Prix schedule for 2019 is finally here, and with it comes an update to how you qualify for the Pro Tour in 2019. Let's get right into what you need to know. Let's start with the event that hits every level of play—MagicFest. The Magic community has made Grand Prix weekends about so much more than just the main event, and we would be remiss if we didn't acknowledge and celebrate that. The community has made them about fun Magic gaming in all its forms: side events, artist booths, cosplay, panels, spellslinging, and, yes, qualifying for Pro Tours. To recognize the full scope of the event, we're calling the whole experience MagicFest. What you've come to expect at a Grand Prix over the past several years isn't changing much. There will still be a main event—and we're still calling that event the Grand Prix—and side events and prizes and, and, and, and. It means that the emphasis will be on coming to enjoy all of the events—including the Grand Prix—held over the course of three to four days. It's a place for all levels of play. It's a Magic event and experience coming to your hometown. The most visible change is that MagicFests will now also be home to Pro Tours. So that means that Pro Tour Cleveland will be hosted at MagicFest Cleveland. It means that if you bomb out of the first day at the Pro Tour, there's a whole, well, festival of Magic for you to take part in with the rest of the weekend. And it means that if you hang around one of these MagicFests till Sunday, you can watch the latest Pro Tour Champion receive their trophy—then head back to that Commander game you and your friends wanted to get to. CFB Events has the full schedule of MagicFest Events on their website plus an update to Grand Prix invite and payout structures. Head that way to find a MagicFest coming to your neighborhood in 2019. And if you want to discuss MagicFest on social media, we recommend using #MagicFest for the events as a whole or #MTGCityName for individual events. The first two Pro Tours of 2019—Cleveland and London—are operating under the current qualification system. Nothing is changing there, as those qualification seasons are already underway. Starting with qualifiers for the Pro Tour in Dallas-Fort Worth (which will start near the end of March), things are going to look a little bit different. Pro Club and Pro Tour finish-based invites – While we are not announcing the precise levels yet, we expect the system to look similar to 2018 as we transition through 2019. Expect changes after 2019. Grand Prix Tournaments – All held at MagicFest, Grand Prix will continue to qualify players for the Pro Tour. However, they may no longer qualify you for the next Pro Tour. Instead, Grand Prix Tournaments will generally qualify you for a specific Pro Tour in the region in which the Grand Prix was held. So if you qualify through a Grand Prix in Europe, it will be for the next Pro Tour in Europe, and so on. Open – Open qualification events will provide one or more qualification slots and will be open to anyone who would like to participate. Qualification events held at MagicFest will be open. Invite only – Unlike the PTQ system of old, these events will use invite thresholds (specific metrics and levels for invitations to be released later) and will be offered by professional tournament organizers and WPN member stores to ensure a comfortable playing experience for players within that region. These will typically be one-day events with one qualification slot and a cap on the number of participants. For the qualification events, we'll be rolling out a pilot program in the first part of 2019 that will allow professional tournament organizers and best-in-class WPN stores to apply to organize one or more qualification events. We plan to evolve that program as we work together with stores and tournament organizers to learn more about the best implementation of direct qualification tournaments. Watch for details and schedules for these events in the coming months. Magic Online will continue to run qualifying events much the same as it has in the past. Finally, note that while qualified players could previously only play in one Regional PTQ, under the new system, players can play in any number of tournaments for which they are qualified until they qualify for the Pro Tour. When we announced 2019 would feature six Pro Tours, we were signaling that next year is going to be a year of change. We are rethinking and reworking our entire competitive gaming system—from qualifying events all the way up through Grand Prix and the highest levels of pro play. 2019 is going to be a transition year toward something better, as we build up to a competitive gaming structure that will look very different come 2020. Competitive Magic gaming has a bright future, and 2019 is our launching pad. We'll see you there.